“Sometimes in life the stars just line up right. I had a dream of a fully accessible treehouse to be built at the Rochester Rotary-owned Sunshine Campus. I had this idea in 2012 before all the treehouse shows. I had no idea what I wanted or who to ask. After about 9 months of searching, I found some pictures online that lead me to B’fer and his crew. After many conversations and a visit to camp, B’fer helped refine my vision. It was obvious he had done this before. We started with handshakes and only signed contracts as a formality. I followed my gut and it wasn’t wrong. The craftsmanship was something I was concerned about. I’m a perfectionist who always wanted to be a carpenter. These guys were well beyond my ability. The treehouse is built like a fortress. We wanted to have something safe that would be here for years to come. Mission accomplished. Building the treehouse has changed the direction of all of our fundraising for the camp. We have focused our marketing committee on this project helping raise awareness of what we do while encouraging the community to stop by camp to see the treehouse and other amenities. It’s a magical place. Fully accessible, we have had well over 5000 special needs kids enjoying this space since it was introduced in 2015. The smiles and memories that are being made by our campers and counselors pay for all the hard work and effort that went into this amazing project. The best part of all for me is this came out even better than I could have dreamed it. Every single thing that was drawn in the concept picture is exactly what we have. We have had no repairs required. I have been on the ramps when the wind is over 50 mph watching everything move exactly where it should be moving….just like B’fer said it would. 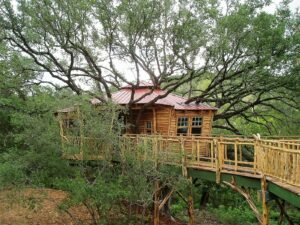 “It is my pleasure to provide a testimonial to the design and construction assistance that Candlelight Ranch received from The Treehouse Guys. 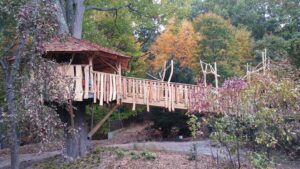 Constructed in the spring of 2004, our fully accessible Treehouse remains a popular part of our activities and facilities. Day groups who visit the Ranch spend time in the structure exploring books, fossils, and artifacts related to the natural world. For overnight groups it is their favorite place to stay. “Why Me, Inc. is a 501(C)3 non-profit providing support services to families with cancer since 1985. I am the Executive Director, David Hagan. 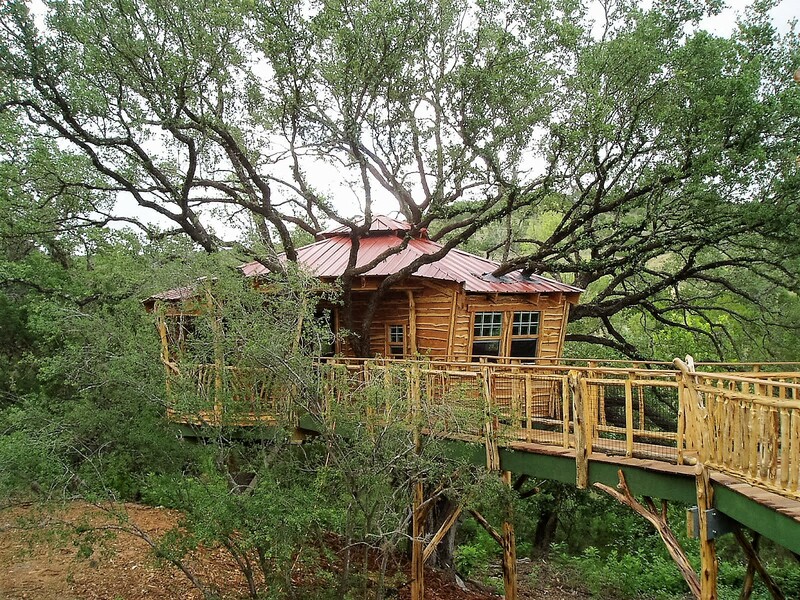 In 2014 I decided, with board approval, to research building a treehouse on the property. 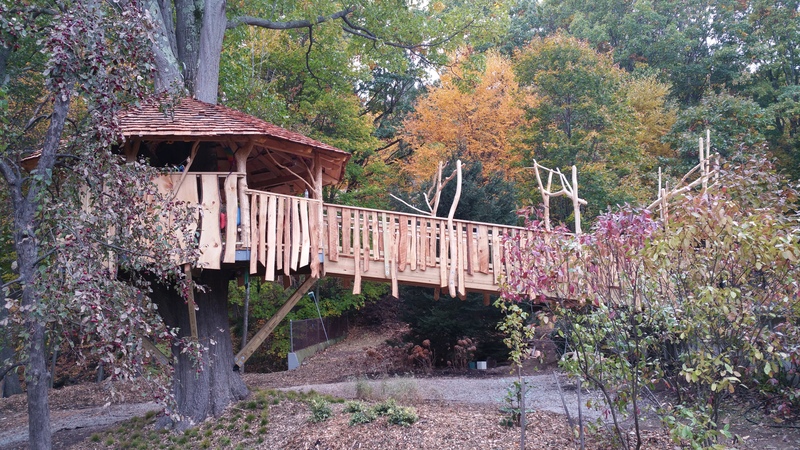 I heard great things about “The Treehouse Guys” from the Directors at Paul Newman’s Hole in the Wall Gang Camp in Ashford, CT. What struck me was that they were so pleased with the project and their experience with The Treehouse Guys. With my sons help, we visited several builds within driving distance and our experience was the same. Past clients loved their experience, the project outcome, and the integrity of the ‘Guys’. From the first site visit, B’fer Roth was a great listener, understood the needs of children with challenges, and was a pleasure to work with. His design captured the essence of our conversation and my vision for the role of the treehouse in the larger context of the property. He worked with me through challenging design constraints due to zoning restrictions, facilitated volunteer efforts and community involvement. They created a unique space that was visually impactful and made the back of the property a destination. It was a perfect compliment to a forested stream. Additionally, the memory garden under the treehouse and the stream have become tranquil spaces for families to live in the moment. I could see this project and was committed to its completion but with daunting design, zoning and functioning challenges, I wouldn’t have wanted any other team. They were great and made the project fun. I relied on their experience, honesty and integrity. It’s easy to see why clients feel so warmly toward them. they put their hearts into every build. It was my professional and personal pleasure to work with them and would most highly recommend them”. David Hagan, Executive Director – Why Me, Inc.